I have been singing this song to myself for the last few months and longing for this day. Praise God for this song and for everyone who helped bring it here to us today! I am stoked that now I’ve me some “back up singers” and musicians that will make me sound *awesome* in the bathroom and in the car! LOL! Thank you! What a great song to have stuck in my head. Love it so much. Thank you, thank you! Thank you for publishing this song and making it available. It is such an affirming message. Bless you all. Glory to God. Fabulous! Thank you! I love it! Thanks!! So glad I can play the song any time I want to. It’s great!! Thank you so much!!! What a blessing this morning! That is so fun, Alice! Thank you for sharing this story, and may those girls grow in depth of their identity in Christ! Yes! Yes!! Yes!!! Thank you for the reminder first thing this morning. I AM a Woman of God! Thank You! Thank You! Thank You! I sing this all the time! One of these days I will write a letter as I want to share with you how the Lord worked BIG in 2014 w/ His timing w/ the LPL event in Ft. Wayne. I had a tough few months and I knew He would be BIG! Love the LPL team and how ya’ll respond to God’s calling! Awesome job on this Travis and others!!! We are all blessed to have it!!! Thank you! What an awesome way to start 2015…Thanks Travis and all the LPL team for sending this our way. How our hearts rejoice! Oh mu gosh thank you so much for this!!!! I am going to send this to a friend who is in fear of hers and her children’s lives in this moment more than ever, and is a strong though young in her Christian faith. Thank you again!!!! Please pray for all victims of honor violence and families affected by honor killings! Awesome!! God answered our Ladies Ministry prayer by having this song released before our New Year Mixer, which is this Thursday!! We will be singing this at all of our events this year!! Thank You Beth, Travis, and Praise Team!! GOD IS SO GOOD TO ME!!!! I just said to my sister this past weekend I was going to put this declaration up on my mirror again…and then He sends this blog for a reminder!! His grace (and patience) abounds with me! The acapella “rap” version has consumed my head since September – this version is wonderful…better than the original version shared in Ft. Wayne at the Simulcast – thanks for sharing this blessing! Thank you so much. I have been waiting for this since LPL. Was just looking at and organizing my Bible teaching notes from the last year and this is what God taught me during that time. This song put a nice seal on the year. Thank the worship team too. I love this declaration! Am going to copy this down and post it above my coffee maker!! First thing I’ll see in the morning–and SOOOOOO necessary! Empowered that’s how I feel even when reading the words! Great way to start 2015. On an unrelated note….. I did not see my entry for the 2015 SSMT. with over 10,000 entries I just got lost even looking. I trust it made it in there! Thank you for going above and beyond our expectation. This is such a blessing to me. Since the conference God healed me from the abuse in my past. We are so grateful for God’s amazing intervention. Be encouraged that as you are a blessing to so many women, they in turn become blessings to other women. Praying for you ministry to always glorify HIM! love this. ’nuff said….- hey travis – when’s the music video?!!! somebody work on a worship dance routine! How can I order a print of the Identity Declaration? While we do not have prints of the Identity Declaration to send to you, if you click on the picture of it you should be able to print one for yourself. Please let us know if we can help you further! LOVE LOVE LOVE!!! Beth wrote the words and Travis wrote the music, right? Thank you! Actually, the girls on the praise team for that event (Elicia, Julie, Nirva) wrote the melody! What a beautiful, powerful statement song! This is going to be my song for the year! Thank you for sharing it with us. This is so so powerful. Brings back memories of the conference AND a reminder of who we are AMEN!!!! Great way to start the new year!!! I love love love this song. Lets get us some JESUS JOY ON SISTERS!!! Amen! Thank you so much. A song easy to learn to be repeated in my heart and mind often reminding and affirming to me that I am Princess of the King of Kings, and of the inheritance I have right now in Him. Amen again. Great song!!! Thank you so much for sharing this! Thank you so much for sharing this! A beautiful reminder for me on a difficult personal day. L-O-V-E!! Thank you for sharing it with us!! LOVE the song!! This will definitely help with remembering the words. Travis and his team did an outstanding job! Thanks for sharing! Pride. Sometimes (in my opinion) we label others because of pride. In saying that this one is this or that one is that, in essence we are saying I’m not that. It’s judging others which is clearly not biblical. I’ve been guilty of labeling. Catching myself and confessing the underlying sin is critical for me. I absolutely love this song!!!! Thank you, for sharing it with us!!! Awesome, thank you so much…Now I can listen to over and over after I figure out how to save it to my computer, haha!!! Thank you again…hope to be able to see you again in person. I still have this print hanging next to my bed where I can see it every morning. Some days I just need to read it two or three times. So, I’m very excited to have the music version available! Love It….What a POWERFUL Song!!! This is perfect! I am doing an experiment: Trusting 40 promises of God for 40 days. 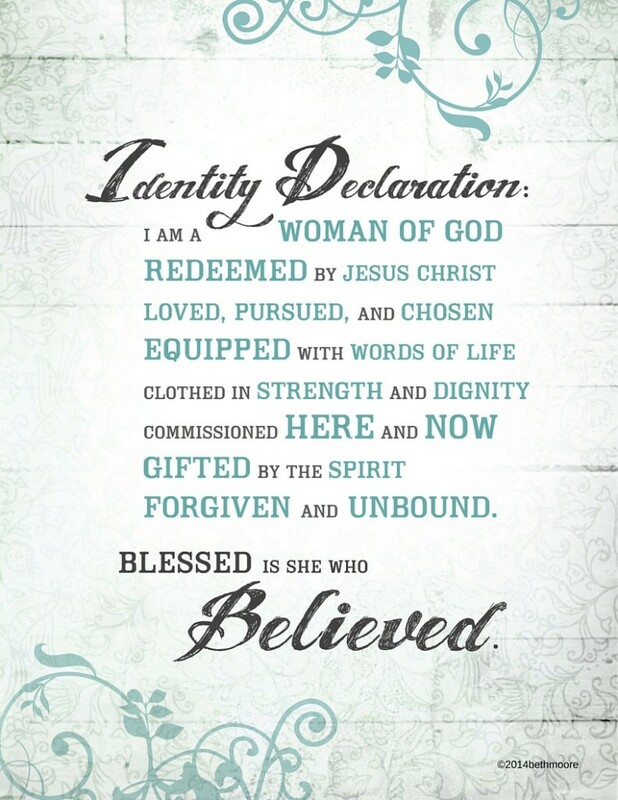 I am finding the “blessed is she who believes” to be true! Thanks for making this available! Thank you for this song!!!! Love it !!!!! Glory to God is another of my favorites. I am going to have to add this to that list. Ooooooo…thank you, thank you, thank you!!! Thank you for this song and for posting the Identity Declaration for those of us who went and for those of us who missed the simulcast this year. My best friend painted this on a canvas for my Christmas gift. It hangs next to the table where I do my morning Bible study and faces the door where I enter my house. I am now reminded numerous times each day just who I am in Christ Jesus. Thank you, Beth! And thanks to Travis and the team for putting it to music which makes it so much easier to remember.